Augustus Fendler, renowned 19th century botanical collector, obtained the first specimen of Euphorbia fendleri in Santa Fe in 1847. (More biographical information about Fendler. 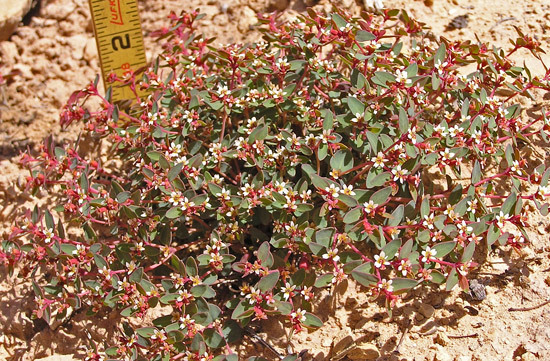 Torrey and Gray described the new species and named it Euphorbia fendleri. 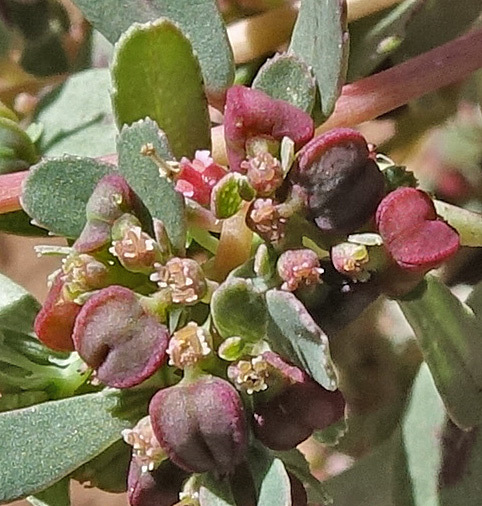 In 1903 John Small reclassified it as a Chamaesyce (pronounced, "cam ee sigh see"), but now most botanists place all Chamaesyce in the genus Euphorbia. Euphorbia fendleri. 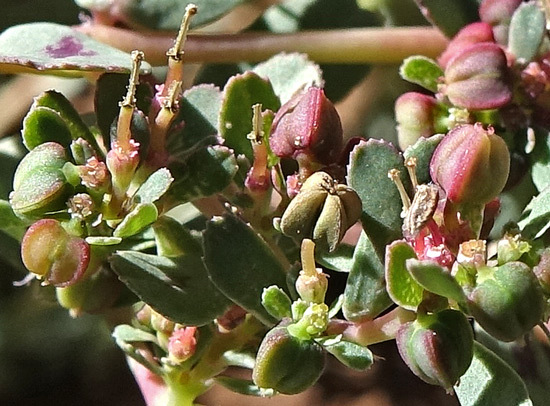 Synonym: Chamaesyce fendleri. 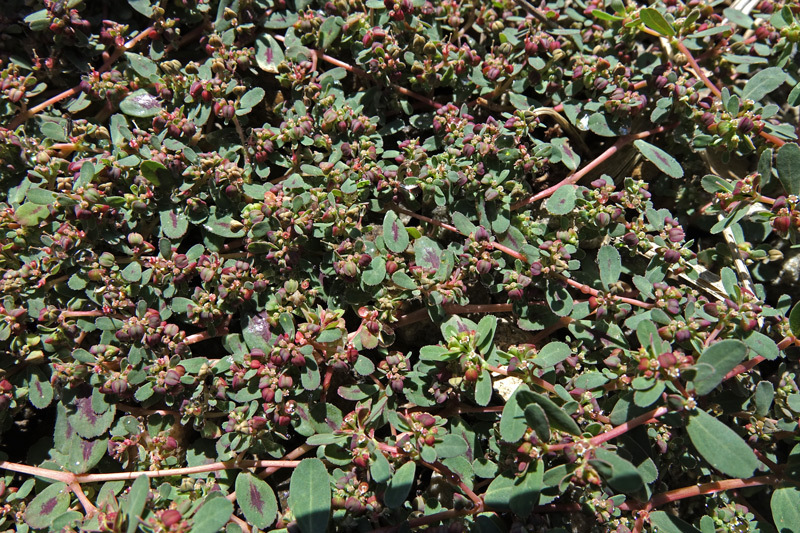 (Fendler's Spurge, Fendler's Sandmat). Semi-desert. Sand and rock openings. Spring. Canyonlands National Park, Utah, May 20, 2004. This perennial grows from woody underground stock and spreads over several square feet in a zig-zag pattern caused by the lack of growth in the terminal stem bud; side buds grow stems into a sprawling web. Leaves vary from oval to spade-shaped. Corona Arch Trail, Utah, April 13, 2005.
is instead a cyathium, a cup-like structure (the maroon structure shown in profile in the upper right of the photograph above) that houses a central pistillate flower surrounded by several staminate flowers. The white scalloped structures are not true petals but merely extensions of the cyathium. 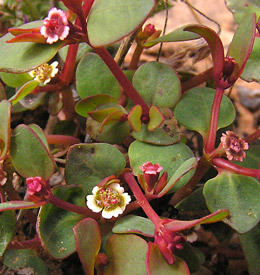 When fertilized, the central pistillate flower elongates, swells, and hangs out of the cyathium. 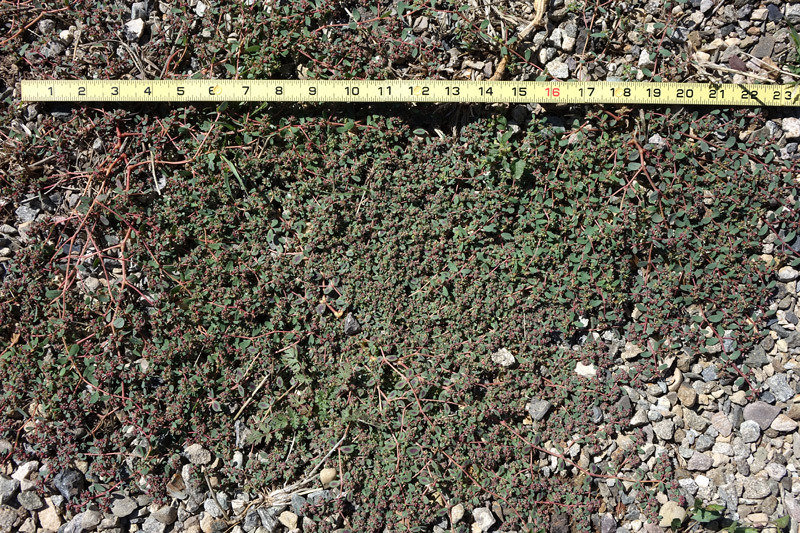 Euphorbia glyptosperma. 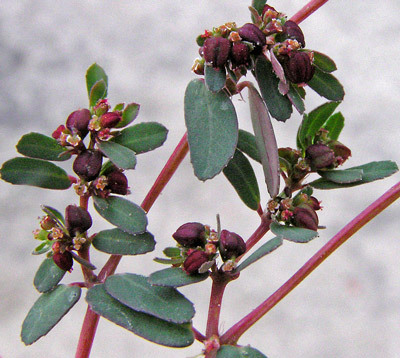 Synonym: Chamaesyce glyptosperma. (Carved Seed Spurge). Semi-desert. Sand and rock openings. Summer, fall. Bisti/De-Na-Zin Wilderness Area, New Mexico, October 9, 2007. Euphorbia glyptosperma sprawls in an interlaced pattern from a single stem that emanates from a strong taproot. You can see that all stems in the photograph at left are branching off a main stem which is just out of sight at top center. The plant is found in all Four Corners states. Plants flower for several months and in the photograph at left you can see new flowers (rimmed in white) nestled near the swelling maroon seed pods. Notice the difference in leaf shape between this Euphorbia glyptosperma and E. fendleri above. 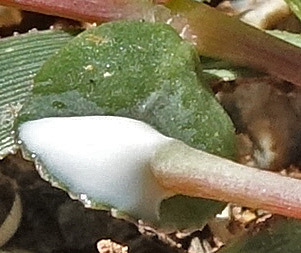 Leaves of E. glyptosperma can be slightly toothed near the tip (as shown here) or entire (smooth-edged). George Engelmann named this plant Euphorbia glyptosperma from a plant he collected in 1856 near the Platte River in Nebraska. It was renamed Chamaesyce glyptosperma by John Small in 1903. "Glyptosperma" is Latin for "carved seed" and alludes to the grooves and ridges apparent on the seeds (not visible in the photographs). This is a native species. Canyons of the Ancients National Monument, November 6, 2009. 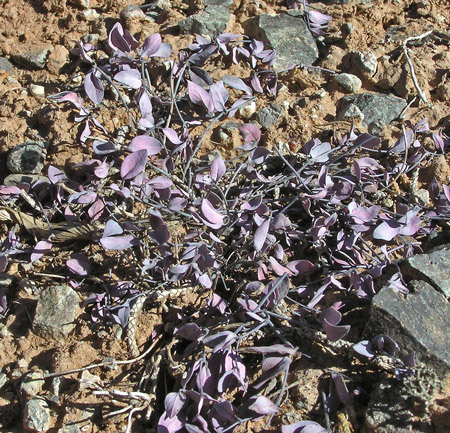 The fall colors of E. glyptosperma make it easy to spot on the bare soils it likes to inhabit. Semi-desert, foothills. Shrublands, woodlands, roadsides. Summer, fall. Near Yellow Jacket Canyon, September 10, 2014. 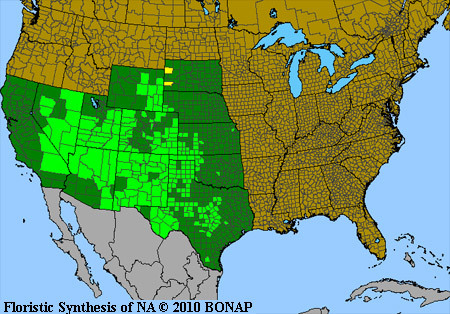 Euphorbia serpyllifolia occurs, as the map below indicates, through much of the central and western United States. 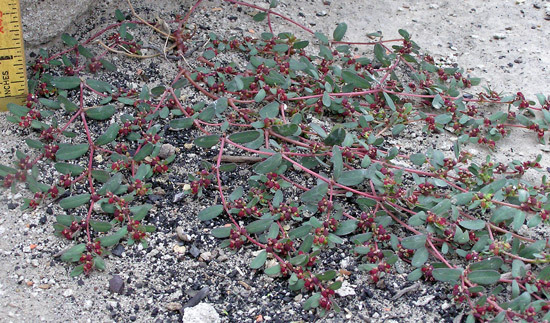 The plant can spread in a circle over 20 inches in diameter and occurs in natural settings as well as in sidewalk cracks, gardens, and roadsides. 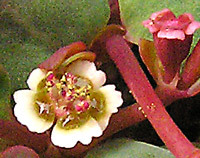 The minute dots of various colors in the two photographs immediately above are indicative of the numerous phases of development of floral parts, which you can see in more detail at left. To give you an idea of size, the angular pods hanging downward on a thin pedicle are just 2-3 millimeters long. 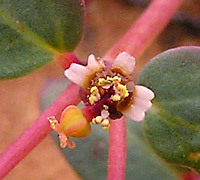 The tiny white dots are the petal-like appendages of the yellow nectary glands. The larger green angular swellings are the just emerging ovary which is on an arching pedicel. The various shades of red and purple belong to the developing ovary whose pedicel eventually straightens and is topped by the fully mature tan/brown ovary. When pods fully mature, split, and spill their 1+ millimeter long seeds, all that is left of the ovary is the central stem, as shown in the upper left of the third photograph at left. Its stems tend to be flattened or winged especially just below each leaf junction (node) versus round stems in E. glyptosperma. Its leaves are commonly very finely serrated at their tip versus more obviously toothed tips in E. glyptosperma. It has 5-18 stamens versus 4 (difficult to see even with a hand lens and not visible in my photographs). 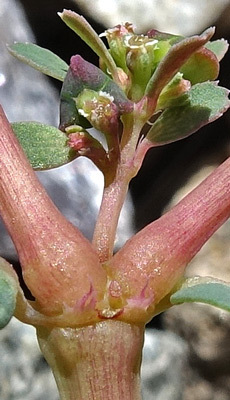 It has smooth seeds versus seeds with transverse ridges (also difficult to see). It is the more common of the two species in disturbed areas. 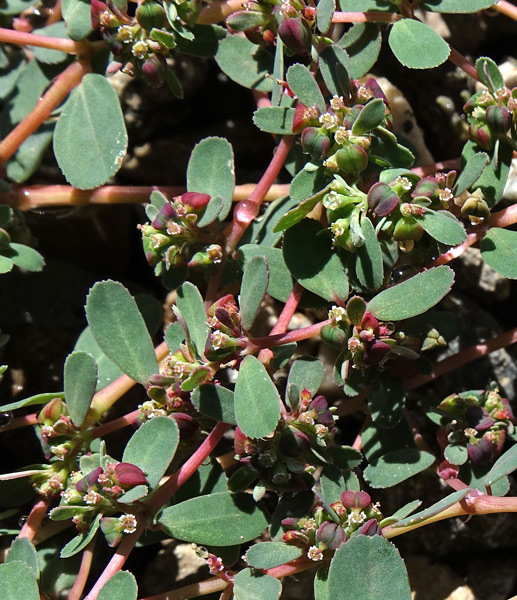 Euphorbia serpyllifolia was named and described by Christiaan Persoon in 1806 from specimens collected in "Hab. in Amer. calidiore" ("habitat in warm American climate) by an unknown collector. "Serpyllifolia" means "with leaves like the genus Serpyllum", Thyme. I broke a stem and touched the end to a leaf to show how abundant the quickly erupting milky sap is.